Home / Apple / iOS / iPad Pro / News / OS / Product Test / Warning: Apple's New iPad Pro Breaks So Easily!! Warning: Apple's New iPad Pro Breaks So Easily!! If you happen to own any of the new 2018 iPad Pro models, you don't need be told that owning that tablet was pretty expensive. However, i bet one thing you didn't know is that getting it spoilt is quite cheap. 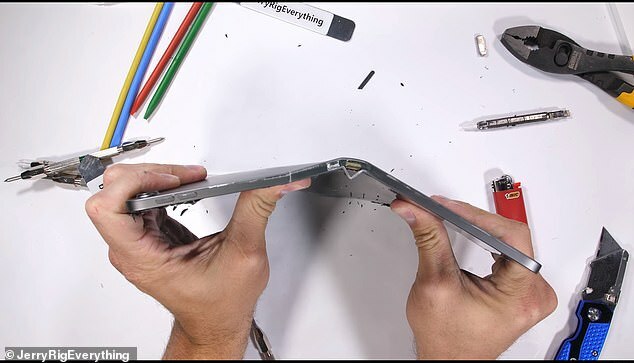 According to a video posted by JerryRigEverything, bending the iPad Pro doesn't require much strength. A simple twist will have the thin Apple tablet snap into a V shape. The Apple iPad Pro tablets; the 11-inch model which starts at $799 and the 12.9-inch model which has starting of $999 all suffer the same fate. One of Apple's accessory that suffered the same fate as the iPad Pro is the Apple Pencil. The $129 second generation bends as easily as the iPad Pro models. A little twist will see the Apple Pencil easily snap into two. The new iPad Pro bendability hasn't gone unnoticed as there has been series of complaints by some iPad Pro. Some complained that their new iPad Pro tablet came bent right inside the box, while others said they left their iPad Pro tablets in their back pack only to later discover that it has bend. Also Read: Everyday More Complaints Keep Trailing The New Sets of iPhones!!! Ok, tablets are prone to bend when compared to smart phones or phablets. However, the case with the new iPad Pros is something else. Were they so intent on beating Samsung that they forgot that they were supposed to create a rigid tab and then ended up creating a flexible? The only piece of advise for iPad Pro owners is to get case for their pricey gadget. Other tests such as the scratch test performed on the iPad Pro too doesn't place it in a good standing.